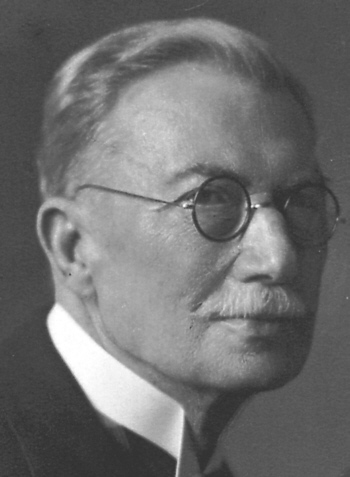 Otto Dempwolff was born on 25 May 1871 as the first of two children in Pillau / East Prussia. The parents are from Hannover and Hildesheim. His father Georg Dempwolff worked as a "Wasserbaukondukteur", later as a "Königlicher Baurat" in Pillau and Memel. Otto Dempwolff graduated from the Luisen-Gymnasium in Memel in 1888. Then he studied medicine at various universities (Königsberg, Marburg, Leipzig, Berlin and Tübingen). He received his doctorate in Berlin in 1892 and made his state examination in Tübingen one year later. He completed his military service in Munich, the last few months as a doctor in Tilsit and in Hamburg. He applied as a tropical doctor in the NGC (New Guinea Compagnie), but he was turned down because he was to young. They advised him (to gain more experience) to two trips to South America as a ship's doctor. 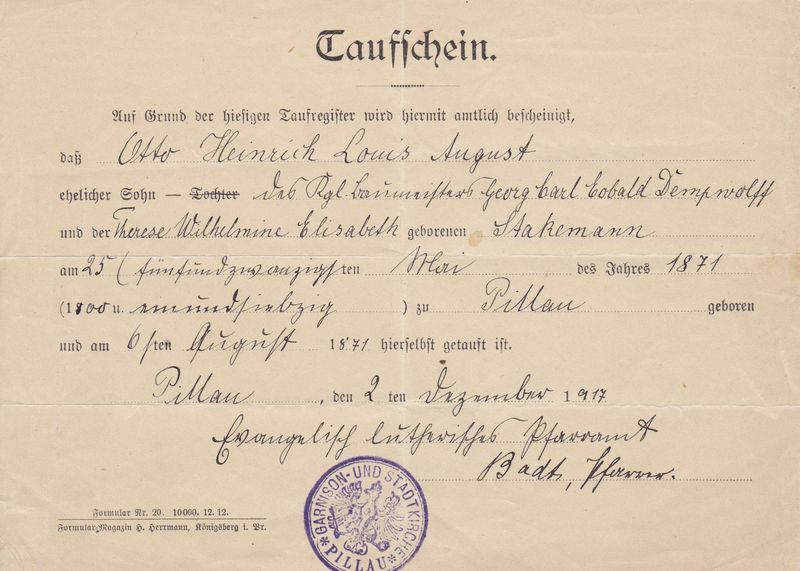 After his return, he finally received the long-awaited contract for German New Guinea. He was there from 1895 to 1897 in Friedrich-Wilhelmshafen (now Madang). He then reiterated two trips as a doctor to South America. From 1898 to 1911 he worked as a medical officer in the imperial protection force in the German colonies South-West Africa and East Africa - interrupted by a two-year expedition (Malaria research) in German New Guinea on behalf of Robert Koch (1901-1903). There he also examined the extinction of some peoples on the offshore islands. He fell ill with malaria a few times. In 1911 he resigned from the protection force for health reasons. Already in Friedrich-Wilhelmshafen, he dealt with the Melanesian languages ​​and later in West Africa with the Nama language and in East Africa with the Sandawe. The latter he also described ethnographically. On home leave, he spent several months as a doctor at the Imperial Colonial Office in Berlin. There he met at a medical examination Carl Meinhof, the beginning of a lifelong friendship. In 1911 he followed his request to work as a freelance lecturer at the Hamburg Colonial Institute. At the end of 1913, Otto Dempwolff traveled for the third time to New Guinea for studies of languages, as a private individual. There he was surprised by the First World War, interned in Australia and then deported back to Germany. The rest of the war he worked as a military doctor in Saarbrücken and Silesia. Since 1919 he worked in the Department of African and South Seas languages at the University of Hamburg under Professor Meinhof. He worked a little with the Nama language (Africa), but he was mostly involved with the Melanesian and Austronesian languages. In 1920, he wrote his habilitation thesis on Indonesian labials. On his 60th birthday, Dempwolff received an honorary doctorate from the University of Kiel and became head of the newly created seminar for Indonesian and Pacific Languages (now Asien-Afrika-Institut) at the University of Hamburg. He is still regarded as one of the best connoisseurs of the Austronesian language. His three-volume work "Vergleichende Lautlehre des austronesischen Wortschatzes" (Comparative phonology of Austronesian vocabulary) is still used and translated into other languages. Likewise, his grammar of the language Jabem.